Happy Monday! How were your weekends!? Mine consisted of lots of yard work (and garden work… I have tomatoes coming out my ears! 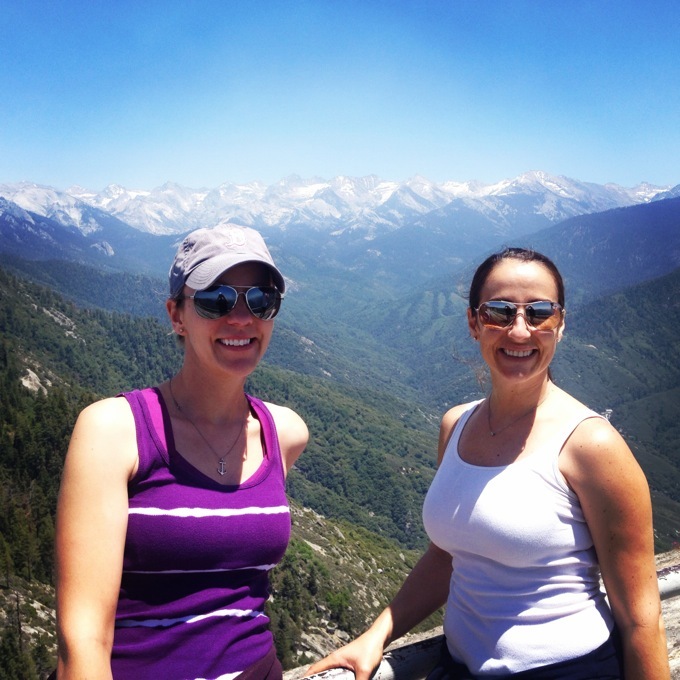 ), with a few awesome hiking views thrown in. The view from Moro Rock in Sequoia National Park, if you’re interested. I didn’t do any cooking this weekend, but lucky for you guys I’ve had this one recipe up my sleeve just waiting to be posted for a while now. I rarely cook steak (aside from when Nick grills it– and even that is not very often lately), mostly because I don’t know what to do with it other than grilling it. I think we know by now that I love all things Thai-inspired, so I immediately ripped this recipe out of a magazine as soon as I saw it. I was still a little scared to attempt the steak, but I went for it. Not only did it turn out, but the flavors were ahhhhmazing. In a bowl, whisk together soy sauce, vinegar, honey, fish sauce, chili garlic paste, sesame oil, lime zest and juice. Pour into a large ziplock bag. Add garlic cloves and steak and seal bag. Refrigerate and marinate for 3-6 hours. Heat olive oil in a large nonstick skillet over high heat. Add the steak (discarding the marinade) and cook until seared, stirring, about 5 minutes. Combine mayo and Sriracha to make a sauce. 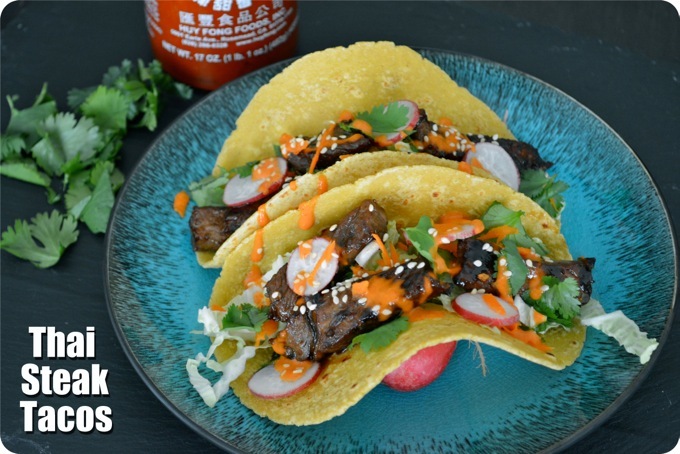 To assemble the tacos, top corn tortillas with steak, veggies and sauce, then sprinkle with cilantro and sesame seeds. This is definitely a dish we will make again! The marinade on the meat was so delicious and caramelized the meat perfectly. The crunchy veggies and spicy sauce were the perfect complements. If you like less spice, just add more mayo to the sauce. If you’re not a steak fan, I bet this marinade would be just as great on chicken. Enjoy! I just love Thai flavors! These tacos sound amazing. Wow! What a view! These steak tacos look amazing and I love the flavors. New York Strip steak is my favorite steal to cook! Oh wow the combo of those flavors does sound fantastic! This is making me hungry! Jess, PUHLEASE come over and do my yard and garden work!! 🙂 I know it needs to be done, but my fingers only found the way to call a local landscaper. 🙂 I planted a garden last year, but haven’t had time this year – and I know I’m going to totally miss my tomatoes. 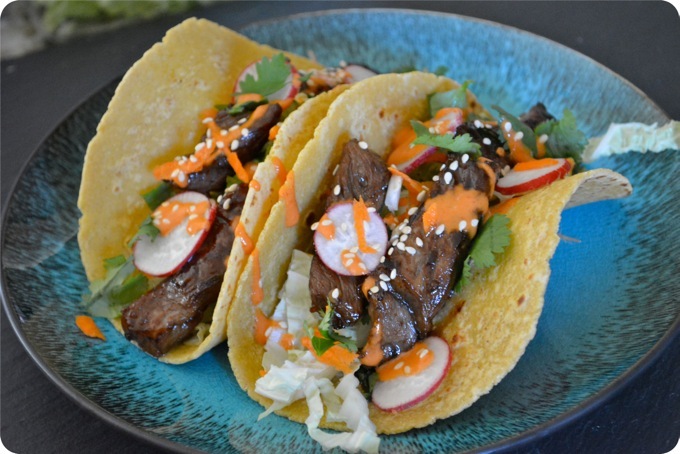 With that said, these Thai Steak Tacos look absolutely amazing! I love recipes like this that are SO perfect for summer time! Thanks for a great recipe! While all the veggies are good, the tomatoes are by far the best!! There is just something about garden tomatoes you can’t get at the store! Thai tacos? Count me in!! These look super delish! I love anything Thai inspired too. These look so gorgeous and I will definitely be making these. Great view!